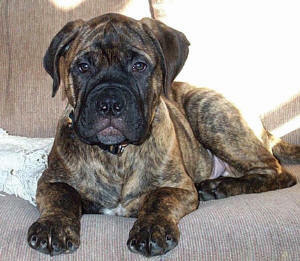 Tygger is our only brindle, bred and owned by Bulhaven Bullmastiffs. 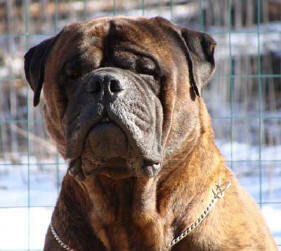 He was born a singleton puppy out of Ch. 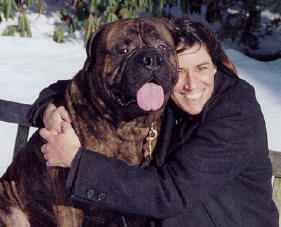 Blackslate's Hot Shot and Bulhaven's Ma Barker in August of 2000 and has since taken the world by his paws! This boy is colorful inside and out. 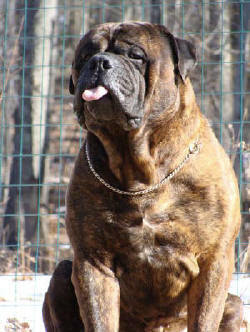 His soul is full of happiness and rainbows while his coat is textured with a stunning red brindling. He is nothing but a bright spot in our home. His mystifying attitude surrounds his structure with confidence and grace. 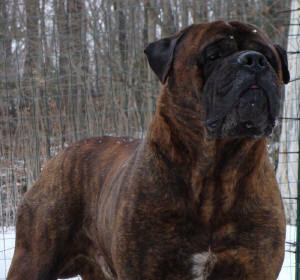 His gate is powerful, his movement with a purpose...this brindle boy is sure to catch anyone's eye. 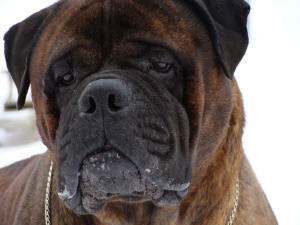 Tygger is a 'gentle giant' who won't let himself be left out of anything. He wants to be a part of the excitement and will even create his own thrill just to attract attention. He is a comedian and expresses himself thru people's laughter and enjoyment. Tygger makes our world a brighter place with his never ending humor. ...all at only 11 months old! We were so proud of this youngster! 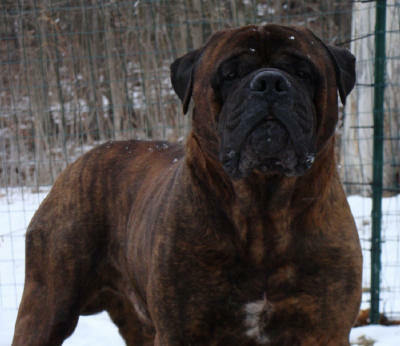 Tygger's spectacular beginning unfortunately turned sour when his West Coast companion (a Breeder who is still active in Bullmastiffs) lost interest and ran out of time or effort to properly care for him. He developed a skin condition which remained untreated and eventually (and fortunately) led to his return to our home in Connecticut. Tygger was flown home to the East Coast in a condition no one would ever expect their "baby" to return in. His spirit was so broken he barely raised his head. This two year old bullmastiff suffered from staph infection, flea infestation, intestinal upset, basic and overall severe neglect. Tygger was welcomed and cared for. He was fed a raw diet of healthy, natural foods. He swam in the ocean to rid his skin of infection and infestation. His blankets were persistently cleaned, his coat given TLC. Tygger is now going thru his seventh year of life. I've been blessed to have him by my side, with me here. I feel his return home was because I needed him more than he ever could need me. He is my reminder of life and it's overwhelming worth. He comfortably snores away his afternoons with the sun warming his brindled head. I often wonder how our lives could ever become "too busy" to not have enough time for the lives in our care. To read more about Tyg and his strength and determination thru unfortunate times, click here. His recovery has also been posted thru updates to his pages. Tygger has a promising future here "at home". We are thrilled to have him with us now and look forward to many more years of TygMan comedy and colorful fun!! Weight: 125 lbs ~ now 140 lbs!! There is nothing stronger in the world than gentleness"
This site created by M. Hannigan. Updated 2008.